Rose Howard has OCD, Asperger’s syndrome, and an obsession with homonyms (even her name is a homonym). She gave her dog Rain a name with two homonyms (Reign, Rein), which, according to Rose’s rules of homonyms, is very special. Rain was a lost dog Rose’s father brought home. Rose and Rain are practically inseparable. And they are often home alone, as Rose’s father spends most evenings at a bar, and doesn’t have much patience for his special-needs daughter. Just as a storm hits town, Rain goes missing. Rose’s father shouldn’t have let Rain out. Now Rose has to find her dog, even if it means leaving her routines and safe places to search. Rose will find Rain, but so will Rain’s original owners. I loved Ann M. Martin's The Baby-sitter's Club series growing up. Martin is a legend in the world of children's literature, so whenever she comes out with a new book or series, I'm eager to pick it up. If you've ever read Martin's A Dog's Life or A Corner of the Universe, you know that her writing isn't always as innocent and simplistic as The Baby-sitter's Club looks to us as adults today. Rain Reign, for example, is written for middle school readers, but it tackles some tough issues. The main character, Rose, has Asperger's syndrome, which is a form of autism. Because of her Asperger's, she is often misunderstood and picked on, even by her own father. Her only friends, it seems, are her uncle and her dog, Rain. Rose's voice is authentic and kid-friendly and really put me into the brain of a child with Asperger's. I saw every exciting, confusing and terrifying moment of her life through her eyes. A novel such as this one would have been hard to pull off in third person, so I am thankful that Martin gave Rose such a vivid voice. Rain Reign was a well-written, emotion-packed book that proves that Martin's talent is better than ever. 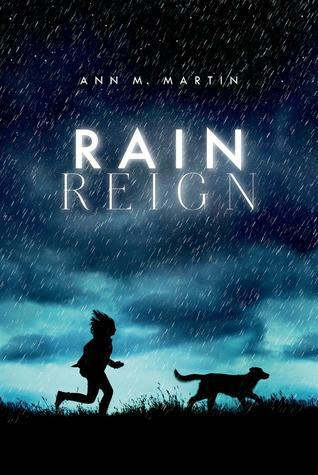 So if you're ever wondering "how do I make a 31-year old lady get a little weepy on the train with a middle grade book", then go pick up Rain Reign, because oh my goodness did Ann M. Martin ever know exactly what buttons to push. Crystalee's review up there is spot on. Rose's voice is perfect, and the characters are described so perfectly that I could easily visualize all of them as I read. Rose carries this book on her own, and her voice is so engaging that I had a hard time putting this one down once I started it. I really felt for Rose, who's trying to understand the world the best she can, only the world doesn't always want to bother to understand her. I think telling this story from her perspective was the absolute right choice, because we get to fully inhabit Rose's world, and for readers who maybe don't know anyone who is autistic, this may be their first chance to really see the world through their eyes. The story overall is simple but moving, and the world Martin creates is so rich in detail in so few pages. It's amazing how you get such a complete picture of everything that's going on, all through Rose's eyes. There is some discussion of child abuse, and Rose's father has a very short fuse, so for younger or very sensitive readers, there could be some scenes that need discussion later. Overall, I think this is an excellent book for any age reader -- older readers will speed through the book because of the simple writing style, but should still find Rose's story and perspective to be very compelling. Definitely give this one a chance, even if you're not usually a big middle-grade reader. This is probably my favorite middle-grade book that I've read, and honestly so far, one of my overall favorites of the year. I know this seems oddly specific, but I absolutely love books with characters who have ASD or OCD. So combine that with all the good reviews I've now read, and I know that this will be a fabulous book for me. Thanks for sharing the recommendation!